Be the first to share your favorite memory, photo or story of Sylvia . This memorial page is dedicated for family, friends and future generations to celebrate the life of their loved one. Westminster – Sylvia Hodgins McCumsey, 94, wife of the late Raymond Garcia McCumsey, of 334 Sara Craig Drive, passed away on Friday, April 5, 2019 at the Pruitt Health Care of Toccoa. Born in England, she was the daughter of the late Walter and Elizabeth Hall Hodgkins Sylvia was a homemaker. Survivors include granddaughter, Mindy Allen of Westminster; grandson, Kurt Freese of Streator, Illinois; sister, Valerie McCollum of Westminster; and two great grandchildren, Brant Freese and Walker Allen. 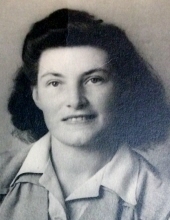 She is preceded in death by her husband, Raymond McCumsey; daughter, Marcia Freese, grandson, Alan Freese, sister, Beryl Slatter and son-in-law, Kirk Freese. Graveside services will be held on Friday, April 12, 2019 at 11:00 am at Heritage Memorial Gardens with Dr. George Harper officiating. To send flowers or a remembrance gift to the family of Sylvia Hodgins McCumsey, please visit our Tribute Store. "Email Address" would like to share the life celebration of Sylvia Hodgins McCumsey. Click on the "link" to go to share a favorite memory or leave a condolence message for the family.